Jameson Jeffrey is 8 months old! My how time flies! Jameson turned 8 months old on February 26th and we just learn more about him everyday as his personality grows. 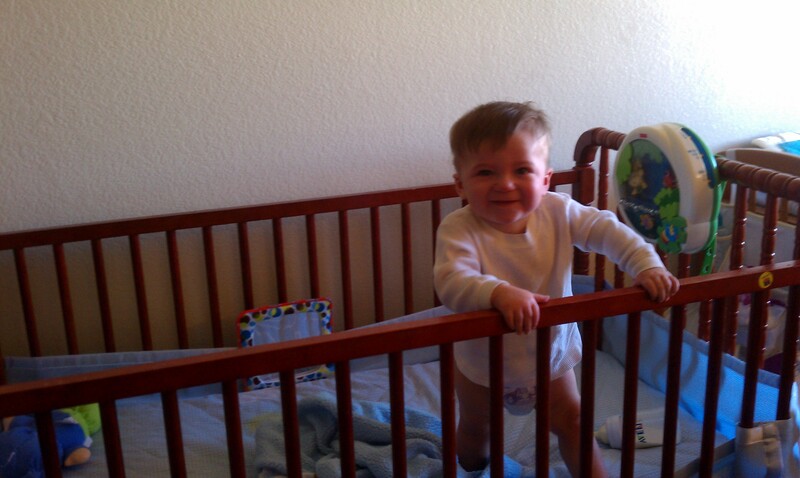 His favorite activity is pulling himself up on everything. He has even started to shuffle himself a little along furniture, the first stages of walking. He still has a long way to go. He doesn’t know how to position his feet properly for walking. His toes curl under, or he will stand on the top part of his foot, twisting his toes so far under that he passes them altogether and somehow rests on the metacarpals. Doesn’t that hurt, baby? Still, there have been a couple of moments when he has stood without support for a fraction of a second and maybe even a full second. Boy does that excite him! He knows what that means! He also loves to take baths and watch his brother take baths. Jameson will sit in his bath seat and just splash and splash. He isn’t afraid of the water at all. I can pour water over his head to rinse the shampoo out of his hair and he might get wide eyed for a second, but no tears and he’s back to splashing within a few seconds. When his brother takes a bath, he likes to come into the bathroom and stand on the outside of the tub. Kanan loves this. He shows off for Jameson, holding his breath under the water, gargling, making silly faces, you name it. Jameson likes to drop toys in the bath and watch them sink or watch Kanan retrieve them for him. Then he repeats the process. for a couple of weeks. As I had posted. And it did make a difference. During those two weeks, his congestion improved and he didn’t have any colds. But then I moved him back onto milk-based formula because the soy constipated him so much. 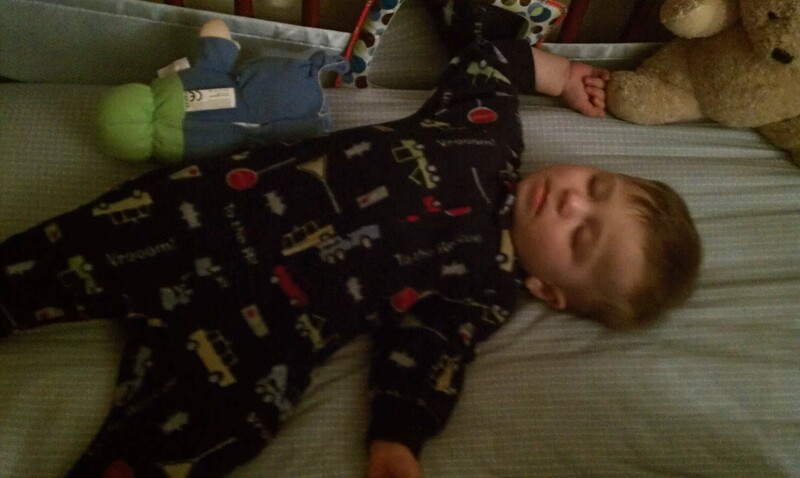 And sure enough, the morning after the first night of milk formula, he came down with cold symptoms. Now, it could be coincidence and it just coincided with a cold. But regardless, he developed bronchitis within a couple of days. So the doctor put him on antibiotics and some cough medicine to open up his airways as he was really weezy. She asked me to put him back on Goodstart Soy as that wasit!) atleast while he was sick. She said we could then mess with the milk-formula again after he was well and see how he does. But it is the only soy he didn’t get constipated on (its just twice the price of regular soy formula, which is why I didn’t stay on it. We had to dip into savings just to even make it this month. So I’ll be honest, after the Goodstart ran out, I just put him back on the milk-formula I already had in my cupboard. I still have the soy formula that constipated him too so I have been putting one scoop of soy and three scoops of milk to try and see if would lesson the possible effects of the milk formula, without constipating him. So far so good. He is on Z-pack and finished the antibiotics three days ago. But they are supposed to continue to work for 5 more days. He seems to be feeling better. No more crying and whining and much less weezing, but his nose is still runny and he has a little cough still. Probably still the lingering effects of the cold. I now have it too, so I do know it is indeed a virus and not allergies. I had mentioned last month that there was a tasty looking homemade formula I could make with rice milk. Unfortunately, however, I calculated how much it would cost to make it per month. It came out to a whopping 288 dollars!! Well, Owen got laid off from City Squares at the beginning of this month and his video business is such a baby still, there is no consistent money to rely on. Therefore, we are basing our budget on my paycheck. We can’t afford it. Sure, people say to make cuts like getting rid of cable, going out to eat, etc. We already do those things. It is crazy that the money that I make is still not enough to live a comfortable American life for a family of four. Now, with the budget we create, we are able to tithe, and to save a little every month to put toward Owen’s tuition and a splash here and there toward a hypothetical future house, but that is it. So the decision is this: after this cold, see if regular congestion continues with Jameson on milk-based formula. If it continues, switch to Goodstart. It is more expensive, but it works and it is not as extreme of an expense as making homemade rice formula. Thankfully, we have only a few more months of formula needed anyway. 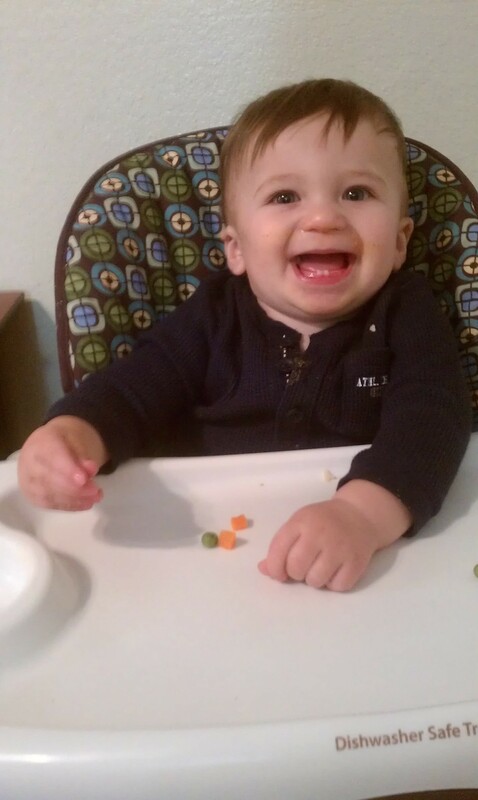 Jameson loves food more than formula anyway, so it should be an easy transition as we approach May. Just toward his 8-month birthday, I decided to stop feeding him after I put him to bed and feed him his bedtime bottle. He has been waking up at 1 or 2 every morning hungry and I’ve been feeding him. But I do it with guilt. I know he doesn’t need to and he is just a trained night feeder. But I just didn’t want to deal with the screaming and crying and feared it would take a long time. It didn’t. It took three nights. The first night, he screamed for like 2 hours. The next night for one hour. The third night, he didn’t bother to wake up. Since then he does wake up at 5 am (almost to the minute every morning!) super hungry and I do feed him for that one because by that time he has slept for about 10 hours. Typically, I bring him into my room for that feeding and then he just falls right back to sleep. He then gets to wake up with Mommy or Daddy. I know this will be the next thing to stop before baby #3 shows up (if you don’t know that, read the blog after this…I’ll post it here after this.). But as for now, we still have about 5 months. 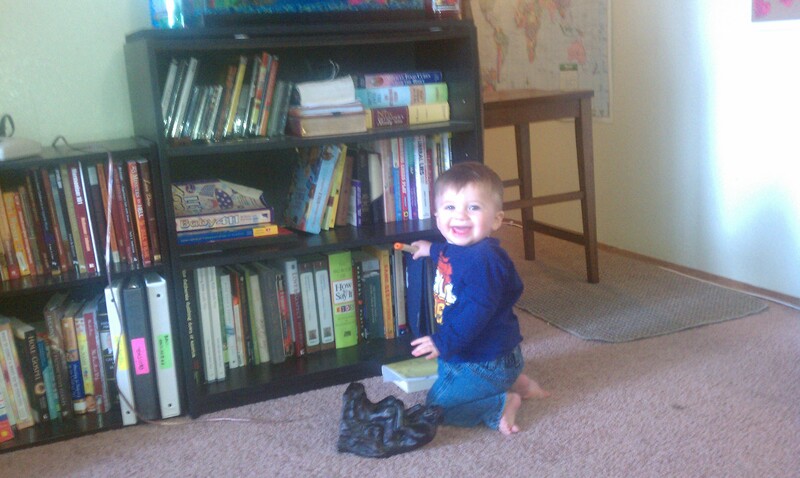 So, I’ll enjoy this for a couple more months and start working on it as we approach his first birthday.